Mercy Mounthawk has a strong tradition in promoting the involvement of students in the world of Science. The school provides a number of extra-curricular opportunities for students to get involved in activities and we have found over the years that engagement in this way certainly promotes a love of the subject. Jessica Oke Cotter,Ciara Murphy, Olivia Moriarty, Tamila Khussainova, Ella Itsede and Robin Porter. Mercy Mounthawk had four projects at the finals. 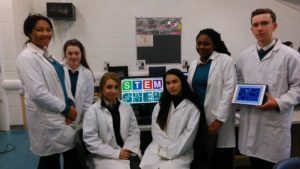 An investigation into the teaching and learning of Junior Certificate Physics and the promotion of STEM to female students. 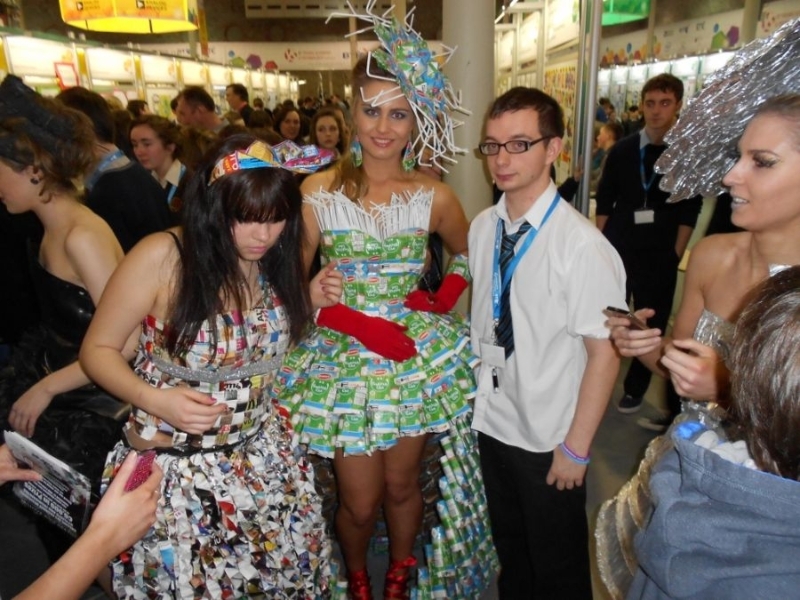 This project won 3rd in the senior catagory…Well done to Olivia and Tamilla!!! 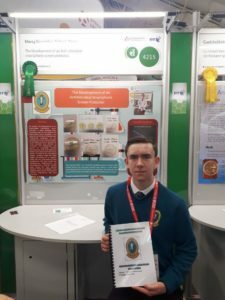 Robin won a Highly Commended Award at the Young Scientist exhibition 2018. The knowledge young adults have on homelessness today. The Development of an Anti-microbial smartphone screen protector. Robin Porter is developing an antibacterial paint that can be applied to a phone case to reduce bacteria growing on smart screens. Robin won a Highly Commended Award for this project. Prior to 2018, Mounthawk was represented at the BT Young Scientist & Technology competition in the social and behavioural sciences section. The project aimed to explore the effects of positive psychology on students both on their mental health and on their academic performance. Aisling Shalvey, Daniel Carmody and Luke Stafford-Lacey are the members in the team. 2013 will go down as a year that Mounthawk can be immensely proud of its achievements in the Science field. 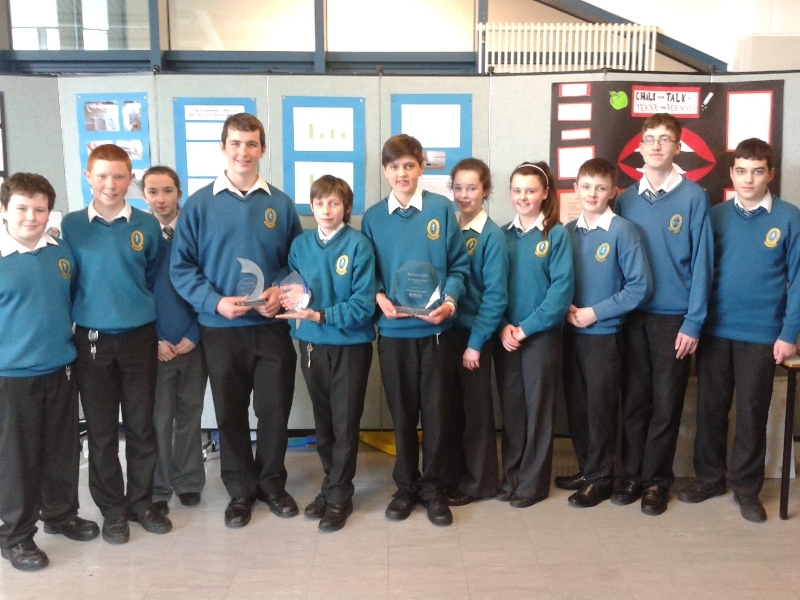 Mounthawk won the overall award at Scifest 2013 as well as 2 other prestigious awards. 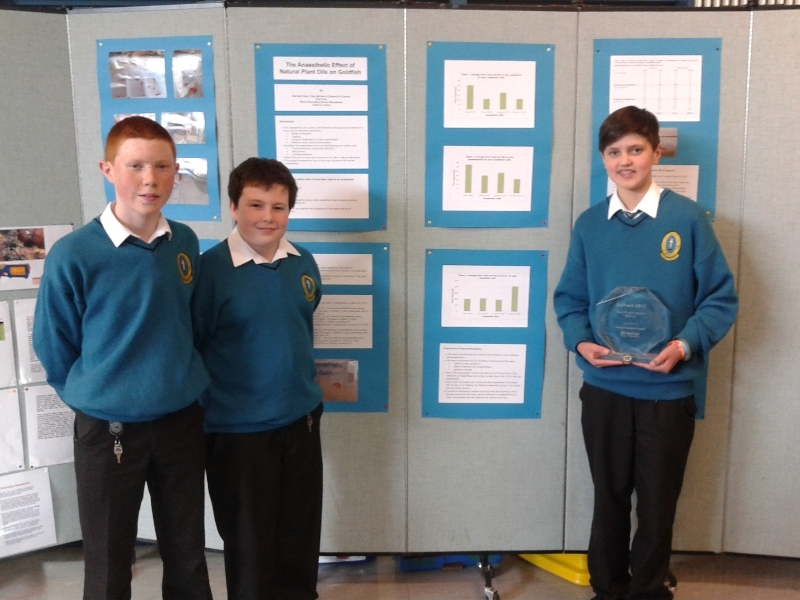 The overall prize was won by first years Colin Clark, Colin McDaid and Diarmuid O’Connor for their project entitled ‘The Anaesthetic Effect of Natural Plant Oils on Goldfish’. The project received wide attention especially as this an area of growth in the fish farming industry. The depth of knowledge and the quality of research carried out in this project is simply astounding and for a first year team to take such a prestigious prize is very promising for the future. 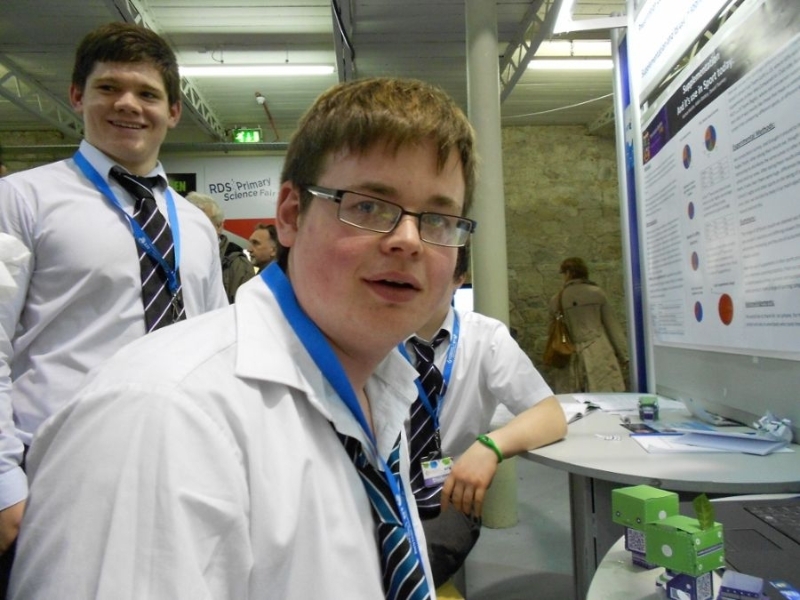 The special prize for Maths and Science went to Killian O’Regan, 2nd Year. His project investigated whether computer games helped improve target shooting accuracy in real life. 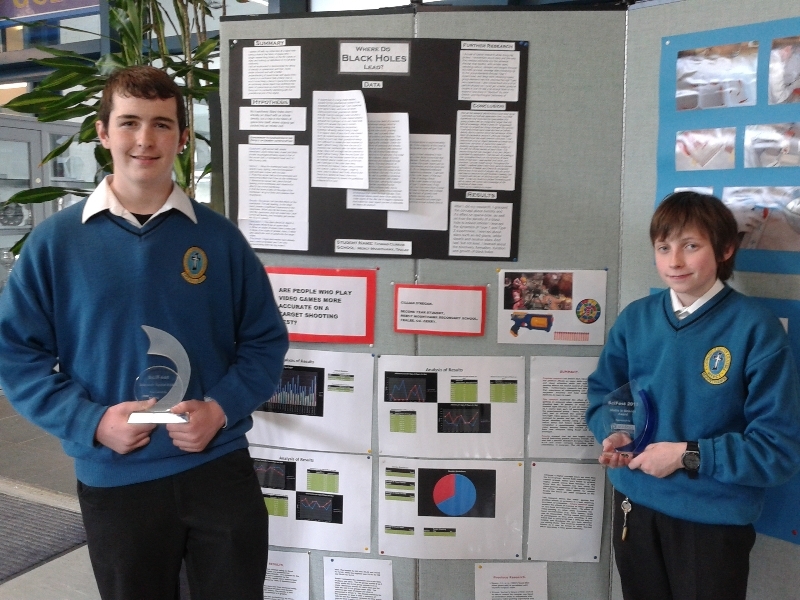 The Discover Space special award went to Thomas Curran, 1st year, for his hypothesis on the nature of Black Holes. Enormous credit is due to the whole Science Department in the school for their continued excellence in inspiring young minds. 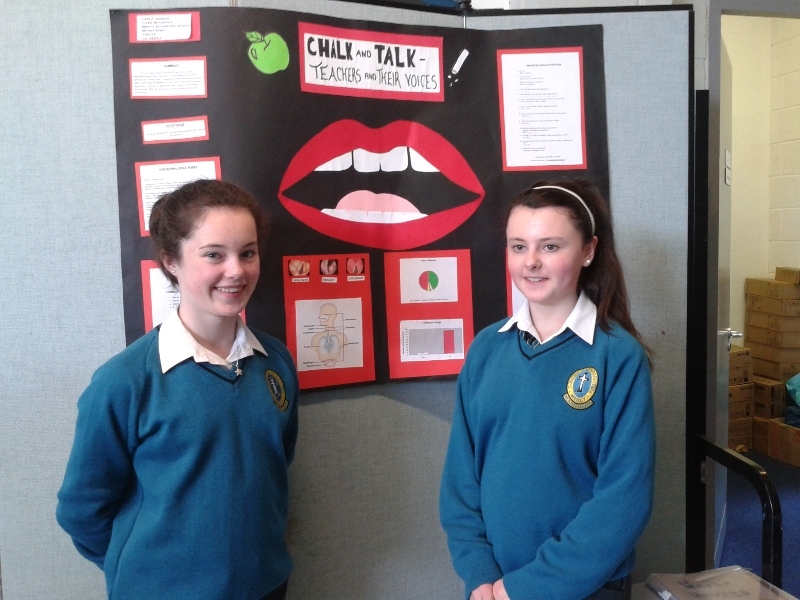 Special mention must go to Ms Mary Enright for her sterling efforts and continued dedication to Scifest. Having landed second prize for a number of years, the overall prize in 2013 was well deserved. I completed a course in Positive Psychology last year and I was so impressed with its effect upon me that I wanted to note its effects on other students. 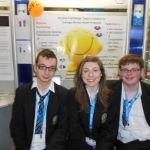 Daniel Carmody, Aisling Shalvey and I decided to form a team to complete a project for the BT Young Scientist competition in Dublin. We had a lot of work to do as we had to gather data on students before they completed the Positive Psychology course and after it was finished. We also had to put together surveys in order to elicit which were the most effective interventions from the course. 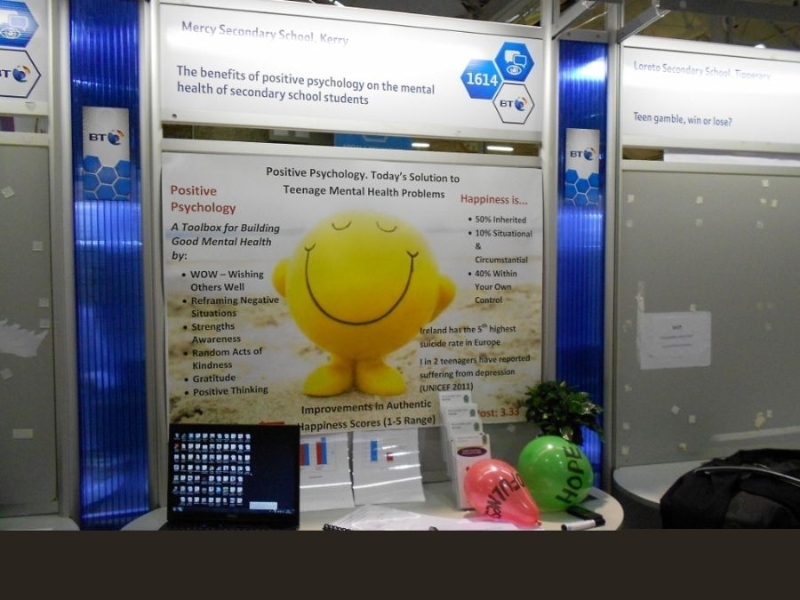 Our project was based on the benefits positive psychology has on the mental health and academic performance of students. To be honest, I never thought of myself as a young scientist as I am not very scientific by nature. However, our project was to be placed in the Behavioral Science section and that was much more suited to my more creative and sensitive nature. Our Christmas break was taken up with analyzing data and learning how to do a statistical analysis of our findings. It certainly took us out of our comfort zone which, according to the positive psychology pioneers, is great for the brain. Armed with our project, a very impressive poster and a plant masquerading as a gratitude tree, we travelled to Dublin by train. The relief at having finally finished this gargantuan task was unreal. 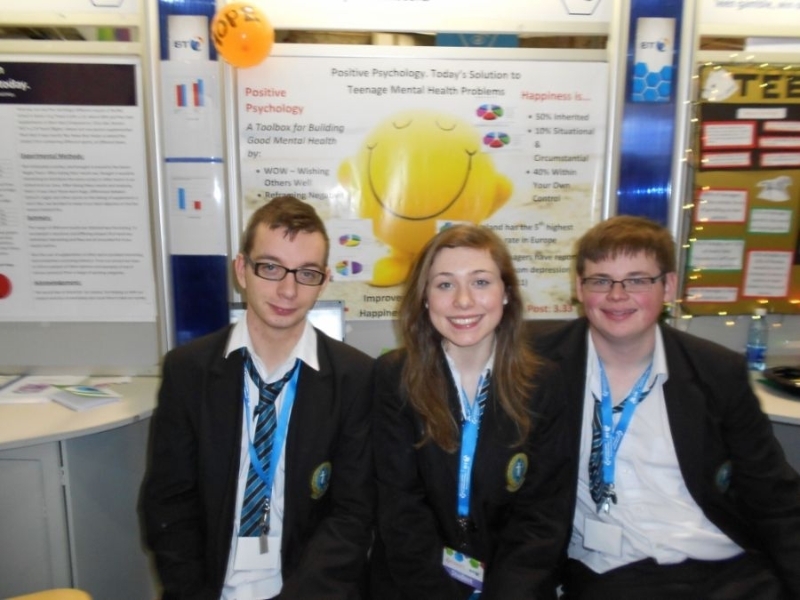 Our journey into the world of science began once we entered the RDS and put up our stand. Within minutes, a man dressed in a red coat arrived with a note telling us that the judge was coming in the afternoon. Phew. Time to prepare. This was the start of a hectic week where I really had to work on my public persona. The three of us took turns going around looking at other projects. There were some amazing projects such as a carbon monoxide invention that texted the owner if carbon monoxide levels were raised. There were also projects on teenage gambling habits, taking sports supplements and our natural deference to authority. My brain felt it was being fed at an enormous rate. A lot of information in such a short time made me feel as though my brain was short circuiting! The judge, an elderly scholar from Trinity, came and read though our project. 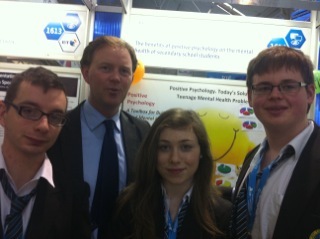 We were able to answer his questions but he wasn’t at all sure about the philosophy behind positive psychology. I hope he was more enlightened having spoken to us. After he left, we had plenty of media interest. We were visited by Mr. Jimmy Denihan, Mr. Arthur Spring and Mr. Michael Healy Rae who were all impressed with our work. Arthur Spring commented that positive psychology was what was needed in the Dail what with all the negative doom and gloom talk on the economy. I learned a lot about myself from my time in Dublin. I had to cope with talking to a lot of people about our work and I enjoyed being in the public eye. It was very exciting having radio stations interviewing us. I also felt that the information on positive psychology needed to be shared with as many people as possible so I was happy to do this. Teenagers need coping mechanisms especially with all this negative talk and lack of prospects for young people. Our project was highly recommended by the judges and we were pleased with this acknowledgement of our work. The best thing about entering the young scientists will be the memory that will stay with me forever. I would certainly recommend any student to enter this great competition. The work is worth it. The attention is top class. 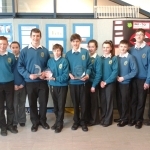 Two teams represented Mounthawk in the regionals of the Irish science teachers senior science quiz. Christine Mullins, Donnacha MacGarry and Conor Higgins came second and qualified to represent the region in the All-Irelands in Trinity College on Saturday the 26th of November. Cara Enright , James O’Connell and Tim Farrell also took part . The quiz took place on the 17th of November in the IT. 23 teams took part in this year’s First Year Science Quiz in aid of charity. It was held in the school Gym on the 18th of Nov. This year’s quiz master was Seán Fitzgerald. 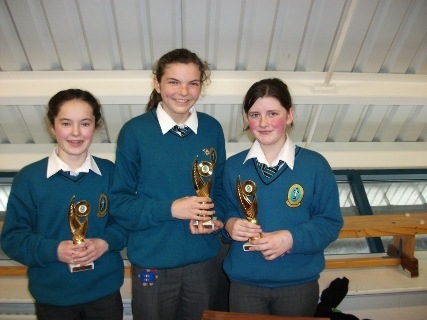 The winners were Gráinne Clerkin, Aisling Williams and Ciara McCarthy. 2nd place: Mary Ann O’Sullivan, Amy Shalvey and Abigail Mahoney. 3rd place: Philip Quilter, David Oyeurande and Colm Carmody.